Have your ever seen a fish that would stay long at one place? Probably no, unless it was a dead one. Thus, regular Pisces must be always on the move. If Pisces cannot swim on the high seas, they anchor themselves to some colorful coral reef. Moreover, a Latin proverb says "Standing water becomes putrid" and Pisces understand that very well. Pisces are not much attracted by power and money. Having power brings responsibilities, worries and often also the need to be chained to one place. Pisces are spiritually and emotionally based beings governed by intuition. One must act quickly in the underwater world and there is often no time for long analysis and prudent judging. 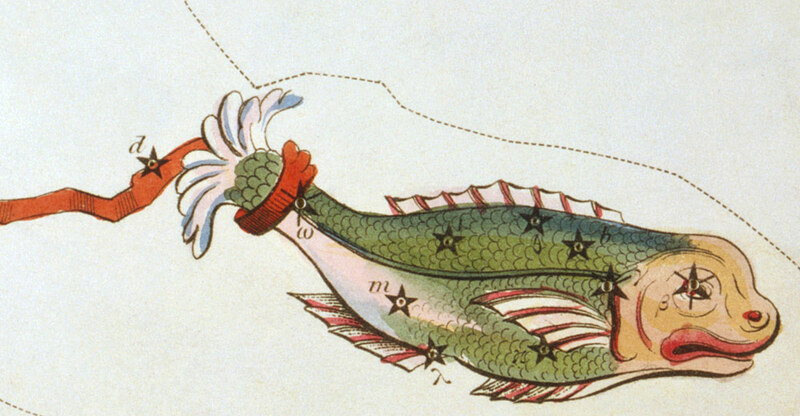 Pisces perceive money as a mean to a comfortable life and not as its goal. Pisces are more aware of the passing value of money than other Sun signs. Pisces have the possibility to be comfortably carried with the flow and only few swim against. Pisces naturally choose the path of least resistance. Pisces are dreamers, so they often put on pink glasses and they see the world in a more pleasant way. The real fish can only live under water and does not know our world at all. Male Pisces are sensitive and perceptive. They usually like to help others. You will certainly not be bored with such a man. As long as he does not swim to another. Female Pisces falls in love with the dreams and ideals of her partner to share them with him. Pisces are rarely chased to the corner. The world is an endless ocean for them. Have you ever seen a fish that would last in one place for long (unless it was dead of course)? Thus, any healthy fish must be permanently in motion. Pisces working as a cashier in a hypermarket or as a gatekeeper, well, this is not an ideal picture. The suitable place for them is for instance a steward(ess) on the plane, which can comfortably travel around the world and is constantly on the move. That is something what really suits the characteristic of Pisces. If Pisces should stay in one place, it must be a noble bar (or anything similar) where they can spare few words with everyone. Indeed, it has to live around – metaphorically speaking: when a fish can not swim on the high seas, it will be satisfied on the colorful coral reef. Power and money do not attract Pisces much. To have the power carries some responsibilities and worries and often also the need to be chained to one place. Moreover, a Latin proverb says "Standing water becomes putrid" (Capiunt vitium ni moveantur aquae) and Pisces understand this very well. They are spiritually and emotionally based, governed mostly by intuition. Because you must often act quickly in the underwater world and there is usually no time for long analysis and prudent judging. Thus, you can count the developed instinct and universal talent among the regular and apparent characteristics of this animal zodiac sign. Pisces are aware of the passing value of money more than others, and therefore they are not attracted to wealth on principle. Of course there are many wealthy people born under the sign of Pisces, but it is very likely that their relationship to property is not the same as by others. They perceive money as a necessary mean to live comfortably and not as the ultimate target of life. Only few Pisces have a chance to live in calm waters. Just have a look around. The present hasty world resembles more the wild river or the stormy sea. Every person born under the sign of Pisces has the chance to get comfortably with the flow, but at the cost of wasting the precious time (comfort paid with the price of similarity and conformity). The second option is to defy and sail upstream. This is of course a big challenge. Many Pisces naturally tend to choose the path of least resistance. The saving of energy is characteristic for them more than for any other zodiac sign. As you know, fish (Pisces) are slimy and if they encounter problems, they naturally try to avoid them rather than to face them straightly. They are dreamers. Pisces often just put on rose-coloured glasses and the world seems to be better immediately. Unfortunately, these perceptions sometimes persist for too long and yet, they loose the real world completely from sight. Indeed, the real fish can live only under water and it does not know our world – what is actually the right metaphor: one can often see how a dreamy fish (Pisces) lives only in a world of its own imagination. Think about a musician who spends his days imagining crowded halls, planing a nice booklet for a new album and writing down the list of guests to be invited to its release – but so far has not made even the first song of this “dreamed-of” album. Or think about an editor who wants to write a book about local sports veterans, and therefore he or she often meets them. But instead of articles only new restaurant bills are growing on the desk. To drift on dreamy waves is simply more beautiful and much easier than to actually actively sail anywhere. "Logic will get you from A to B. Imagination will take you everywhere" – this is the characteristic life motto of people born under the Pisces zodiac sign. To provoke Pisces to a bitter debate is not easy. Pisces are nimble, and they will answer “maybe” instead of direct “yes” or “no” to most of the questions. The world is the infinite ocean for them. Whay should they go for a dogfight when they can swim freely? Only rarely are Pisces pushed into the corner, but even this is not easy to achieve. Remember, have you ever tried to catch a fish in the creek with bare hands? Of course, there are also predatory fish and sharks, but those are really the minority. The skilful ability to escape is very characteristic for Pisces. Unlike other zodiac sign, Pisces are not very sincere (they suffer with the“white lie” syndrome). Perhaps they say, “Why to rock the boat? We have a busy day today, don't we?” For example if they think that you are badly dressed, they will not tell you directly: “Why do you have this terrible clothes?” but rather “Would you like to try that nice shirt, you've got for Christmas?” Intuitively they know that almost nobody wants to hear the naked truth, and moreover – our world spiced with a little imagination is much nicer place to live. Thus, you can count peacefulness and searching for spiritual values to their significant characteristics. Man born under the sign of Pisces is intensively aware of his sensitive personality. He perceives that he is distinct, separate and individual being. He can be responsible. And the Pisces man appreciates life and its fleeting moments. This man realizes that we will not live forever. Pisces men are often emotionally distant from other people. Such man can unconsciously withdraw from an unnecessary activity and work on his own goals. Pisces men live without prejudice. They are sympathetic and perceptive. Before this man would start to criticize, for example, nudists on the beach, he would undress first, at least for a while, and try what it actually feels like to be completely naked in the sun. Most noticeable traits of the Pisces personality are the changeable mood, the sensitive nature and the high ability of empathy. Pisces is a curious and romantic soul. You will certainly not be bored with such a man. But frankly, only if he will not swim to another woman. Unfortunately, even with this fact you need to count (the feeling of freedom is often stronger than the urge of responsibility). But if you are lucky, and you certainly are, you come across a sensitive and perceptive man who is faithful and likes to help others. However, be prepared that variability and unstable temperament are present among his personality traits. Pisces are adaptable and they usually hold back in society. The question is how they grasp the important chance which comes from time to time. Some men do not recognize the tide, even though the water goes to their ankles and their shoes are already pretty wet. But the high tide is essential (it is a metaphor for the influx of positive occasions). When Pisces do not use it in their prime, you can hardly expect they success in an old age. Than, such lost existence is often happy enough only with own dreams. But if you notice that your partner is a fish that really knows how to seize opportunities, then you can cruise the sea along happily for many years. The sense of romance and imagination are important traits of his personality. Pisces women often avoid obstacles, they are fickle, elusive and subtle. Among their positive personality traits you will find the social conscience, the love of man and animals and increased perception of justice and humanity. The Pisces woman believes in the fateful meetings and love beyond the grave. Although Pisces women love deeply, they still live in their own personal reality, which remains impenetrable to others. Because of the rose-coloured glasses they sometimes have problems coping with everyday practical life. The Pisces woman makes fine and very feminine impression on men. These women do not have a desire to control man's life. The Pisces woman falls in love with dreams and ideals of the man, to be able to share them. She can sometimes think that a man can drive a car with one hand and solve crossword puzzles with the other – just because he is the right one, the loved one! Do you think it is far-fetched or a complete fairy tale? Truly, such behaviour in love does belong to Pisces and to their very specific personality traits! Many Pisces women never sober up from the dream of love. The Pisces woman is not governed by reason and by profit-seeking calculations, but above all by feelings and intuition. She is able to know soon if they are both tuned to the same wavelength with the man. And to live with someone without love just for the money? This is definitely not a tempting idea for women born under the sign of Pisces. Pisces women are very sociable – you know the shoals of fish that sail the seas in the same direction? These are the ones, Pisces! They appreciate hearty relationships and peaceful environment around. If you take good care of them, they will reward you with tenderness and love. The ability to reflect the energy you give them is very important personality trait of all Pisces women. Thus, be careful how you address them and treat them.